Fourteen 29,000-year-old fishing net sinkers that are considered to be the world's earliest have been excavated in Jeongseon, northeastern Korea, a university museum said Tuesday. The fishing net sinkers made of limestone represent a rare discovery of fishing gear from the Upper Paleolithic era or the Upper Old Stone Age, according to the Yonsei University Museum. 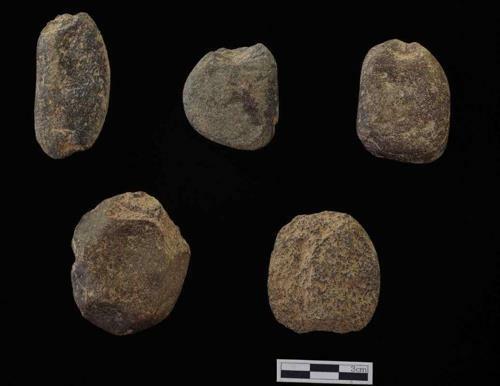 The sinkers were unearthed during an excavation of four cultural phases from the Paleolithic era at the Maedun Cave in Jeongseon, Gangwon Province. The 14 sinkers comprised three from the first and top cultural phase, one from the second cultural phase and 10 from the third cultural phase, from which a jagged stone tool and a flake of stone were found together. Researchers at the Korea Institute of Geoscience and Mineral Resources have identified their ages as from 28,550 to 29,460 years by radiocarbon dating of charcoal contained in the lower part of the third cultural phase.